San Antonio is the second largest town in Ibiza, and is considered by British clubbers to be the clubbing capital of the world. It is situated on San Antonio Bay, on the west of Ibiza. Ibiza is synonymous with clubbing and the nightclubs in and around San Antonio attract the best DJs from around the world such as Tim Westwood, Fat Boy Slim and Paul Van Dyke. A great place to start off the evening is in one of the bars along the Sunset Strip such as Mambo, Savannah and the exceptionally smooth (but expensive) Café del Mar where crowds gather every night to watch the sun go down. The clubs in San Antonio include Eden and Es Paradis, famous for its water party. Amnesia and Privilege (the world’s largest club) are both located on the long straight road to Ibiza Town, where Space, Pacha and El Divino are all located. The Egg is the best known landmark in the port of San Antonio, commonly used as a meeting place by groups who have become separated. 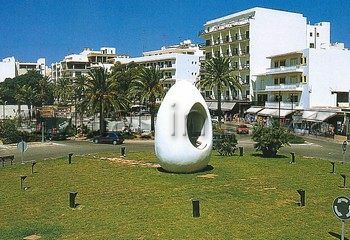 The Egg is a statue erected in the early 1990s to commemorate the local claim of having been the birth place of Christopher Columbus (there is a similar claim that Hannibal was born in the region). The statue is in the shape of an egg, containing at its centre a model of a 15th century ship. The choice of an egg comes from a story about Columbus who, when ridiculed over his claim that he could find a western route to the Indies, claimed that he could make an egg stand upright, which he did by cracking the base of the egg. Part of San Antonio's harbourside promenade, Passeig de ses Fonts is an area which was developed in the early 1990s to improve the appearance of the town. It features many plants, including palm trees and rubber plants, as well as fountains, which are illuminated by night. The opposite side of the street is lined with pavement cafes as is worth visiting on a sunny afternoon. During the busy season, late June through August, San Antonio is dominated by young holiday makers in groups and couples, outside of this peak period San Antonio is more suitable for families.